Modular system for complete cooling systems: Rexroth provides variable speed drive solutions with very fine and wide adjustment range. Manufacturers of rail vehicles require efficient and easily configurable cooling systems to reduce energy consumption and comply with new and complex emission guidelines. Fan drives that provide very fine speed adjustment are required to fulfill the important role of proper temperature control. Exacting design requirements, such that diesel engine cooling circuits in power conversion generators can maintain tight temperature windows irrespective of load and environmental conditions, all while reducing fuel consumption, are our hallmark. State of the art designs require a more intelligent cooling system. Bosch Rexroth has therefore developed a modular drive system with specially engineered control units. Together with the control system for the diesel engine, the cooling system control unit delivers optimum fan speed. Variable displacement axial piston pumps generate the necessary flow to drive the fans via compact hydraulic motors. The cooling system control unit is part of the Rexroth BODAS family of modular mobile control systems. The electronic hydraulic system control allows rail vehicle OEMs to tailor drives to various climatic zones and update profiles via software – with no changes to the hardware. 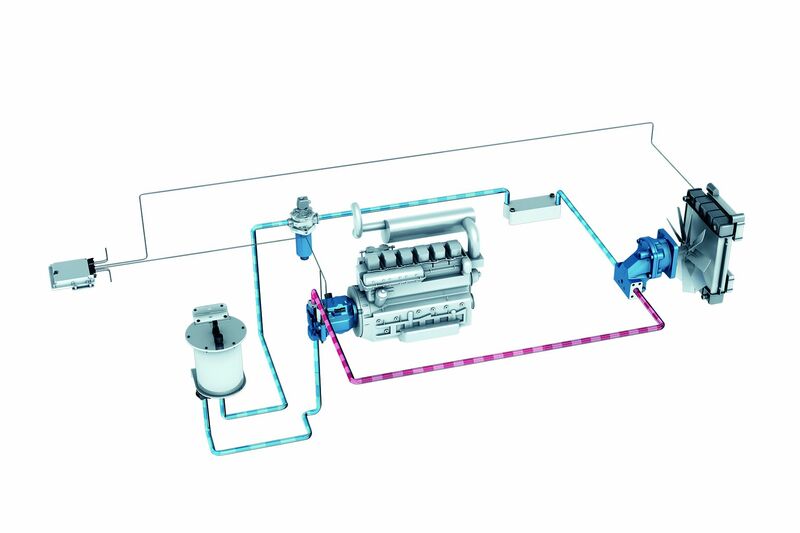 The system solutions from Rexroth decouple the diesel engine speed from the cooling fan speed. The electronic control system monitors various sensor feedback data such as the temperatures of engine coolant, turbo charge air, generator coolant and hydraulic oil. Using these sensor values, it calculates the necessary cooling power independent of engine speed. As a result, it shifts the technical challenge from cooling mechanics to intelligent drive control. For many operating conditions, achieving maximum cooling is not the main goal; it is instead to keep the charge air flow within a narrow temperature window in order to ensure optimum exhaust gas combustion. Recent developments in electro-hydraulic in high performance solutions use hydrostatic circuits and secondary control systems with variable displacement motors. With these control system enhancements, efficiency gains increase while the fuel consumption of the diesel engine is further reduced. Rexroth can also utilize variable speed electric fan drives to cool power conversion. Rexroth has been a reliable drive and control specialist for decades and a development partner to manufacturers of rail vehicles of all types. Rexroth has been heavily involved with the simulation, construction and design of cooling systems, covering everything from the selection of components to the software for control and including connectivity with the overall system. Additional information is available online at www.bosch.com , www.iot.bosch.com , www.bosch-press.com , www.twitter.com/BoschPresse . As part of the electronification of mobile hydraulics, Bosch Rexroth is developing new, data-based services for all aspects of rail vehicles. The PredictDrivetrain service from Bosch Rexroth detects wear using operating and sensor data and is able to determine the remaining service life. Thus, downtimes for rail vehicles in the field can be avoided without the conventional, pre-scheduled preventive maintenance intervals. The lean determination of operating data also serves as a basis for the application-oriented design of mechanical components using the NextGenSpec app without the danger of undersizing or oversizing. For the assembly of new vehicles, CalibrateHydraulics significantly reduces the commissioning effort with the online transfer of test bench data for components to the OEM. Connected hydraulics increase the availability of machinery and plants through condition monitoring and predictive maintenance. For this purpose, Rexroth offers scalable solutions, from individual units with local evaluation to the complete, cloud-based monitoring of large plants. Sensors measure all relevant operating conditions and software detects wear before it leads to failure. Retrofitting kits also economically integrate already installed plants into these concepts.